Legendary Max and Moritz would have had a field day planning their famous "attack of the beetles" on Wilhelm Bushs poor Uncle Fritz: large black bugs as far as the eye can see. In the north of Thailand they have other ideas for these six-legged creatures. Clear the ring for the gladiators! Like two angry sumo wrestlers, these two beetles go for one another. The impact is so immense that you can still hear the "armour" crashing two metres away. Beetle versus beetle. Armour against armour. All six legs push with full force against their rival, leaving their tracks behind in the soft Jute-wood arena. You think you can hear both fighters groan and, for a moment, nobody moves a millimetre in any direction, despite "full throttle". Suddenly, there is a quick head movement, a skilful leverage grip. With his intimidating "forceps-like jaws" the smaller of the two has gripped his weighty opponent in the back of the head, lifted him up, so that the larger one is distraught with all six legs in the air, propels forward and tries to hurl him from the battle wood. 14 grown-up men, who have been following the duel with a spellbound look and an open mouth, break into shouts and jubilations: "Yes, now!" "Give it to him!" "Go on, drop him!" In the Thai language it sounds something like this to Europeans: "Lolololololo!" "Aaaaadaiiii!" "ouuh kamm, kamm, kamm, ouuh lololololo!" The fat one is too heavy. In addition he has sunk his forceps deep into the neck of his attacker and doesn’t even think about letting go. The small one must once again drop his rival nearby. For almost seven dramatic seconds. The fight goes to the second round. 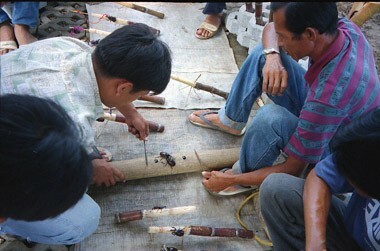 At the same time each year the Eastern embankment of the river Ping in the small town of Chiang Mai turns into a fairground for Rhinoceros beetles for about a month. The "Kwang Song" (or Xylotrupes gideon L. from the Scarabaeidae family) that has become a menace in Thailand, has its "rutting season". 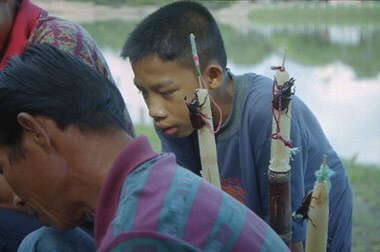 Innumerable little men fired with the passion of mating cavort in the koruna trees of the jungle in Northern Thailand in search of lovers. And just as it is for jealous young men, the numerous declarations mean there is a fight for the "Love night". 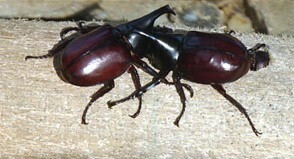 Originally, only the children played in the countryside with the courting stag beetles as a pastime. In the meantime this has become something for grown-ups as well as a lucrative business. 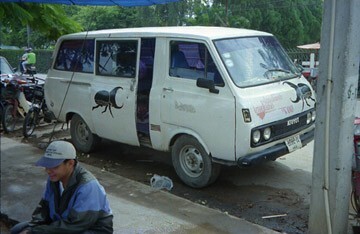 Depending on its size and aggressiveness, a beetle can get between two and four Euros in the market in Chiang Mai. For tried and tested champions, people may even pay up to 200 euros. And despite the state and regal ban on the game, a few coins inconspicuously change hands after a dual. What to us in Europe is regarded as cruelty to animals does not give the Thai people a bad conscience. The Rhinoceros beetle larvae kill hundreds of banana trees and coconut palms each year in the South and are considered to be pests in Thailand because of their superior number. 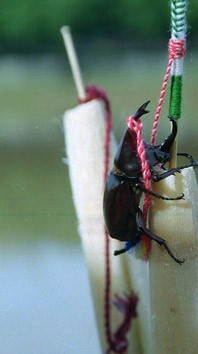 When the Rhinoceros-beetle weeks begin in Chiang Mai, after the planting of the rice, a right little industry develops. The beetle dealers arrive from the surrounding villages at the weekends to sell their wares to the highest bidder. Whilst someone spreads out his crawling treasures on the ground, the person next to him starts up a refreshment stand; someone else offers roasted rice for the hungry customers and another sells beetle accessories. An absolute must for anyone who steps into the shop here are the sweet sugar cane stems that serve as nourishment for the animals. There are also colourful "beetle-leashes" to attach to the valuable warriors, wooden battlefields with an internal chamber in which the female Rhinoceros beetle is held for "motivation," and small, hand carved wooden beaters. These pencil-sized rods are as important to both trainers of the crawling gladiators as a whip is for a jockey. 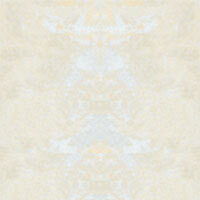 With tense faces, they sit at the respective ends of the roughly metre long "arena". Each twirls his mini beater between the thumb and forefinger of the right hand and thereby produces a quick, drumming noise on the wooden battlefield that forces the beetles upon one another from behind. According to individual taste and persuasion, a small steel clip is also attached to the stick, which makes additional noise. If one of the opponents falls, is thrown or walks off the wood the fight is over. The victorious beetle is leashed once again, eats a few morsels of sugar cane as refreshment and waits for the next challenger. Admittedly sometimes the losing beetle becomes the real winner, for example when the owners frustration after defeat is such that the "failure" is purposefully cast onto the nearest tree and is then able to mount his lover to his heart’s content.